Orbital has developed a medium-class launch vehicle, dubbed Antares (formerly Taurus II), to extend its family of small-class Pegasus, Taurus and Minotaur launchers. The Antares design adapts elements from these proven launch technologies along with hardware from one of the world's leading launch vehicle integrators to provide low-cost and reliable access to space for civil, commercial and military Delta II-class payloads. The first stage structure is manufactured by ukrainian Yuzhnoe company and features two LOX and Kerosene fueled AJ26-62 (americanized Russian NK-33) engines of N1/L3 heritage, built in the early 1970ies. The stage structure is based on the Zenit launch vehicle. The second stage is a Castor-30, which is based on a shortened Castor-120 solid rocket motor. A Castor-30A second stage helps propel the first two Antares-110 rockets into orbit, then a higher-performing Castor-30B motor was used with the Antares-120 on the third and fourth flights in 2013. On the fifth flight, the stretched Castor-30XL upper stage was introduced on the Antares-130. The optional third stage called BTS (Bi-Propellant Third Stage, formerly ORK, Orbit Raising Kit) is based on the propulsion system of Orbital's Star-2 satellite bus. For high energy orbits a Star-48BV can be used as third stage. An enhanced version called Antares-130 featuring a Castor-30XL upper stage will be used for later flights. 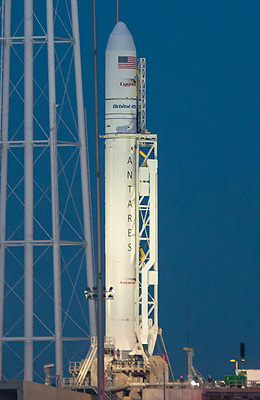 Antares is designed to achieve a 98% or greater launch reliability. It was developed, manufactured and launched using identical management approaches, engineering standards and production and test processes used in Orbital's other major launch vehicles. The vehicle is launched from a new launch pad LA-0A at Wallops Island, where the former Conestoga launch pad was located. In the aftermath of the explosion of the first Antares-130, Orbital decided to discontinue the AJ26-62 powered series due to reliability issues of the engine and to speed up the introduction of the re-engined Antares, now planned for early 2016. The re-engined version will use two RD-181 engines.